← How To Build Jumps for $35! Emilee and her boyfriend Lucas did make it out this weekend. We were supposed to camp Saturday, but I ended up working all day and they were running behind so they rolled in Sunday morning with their two horses, Rohan & Cody. 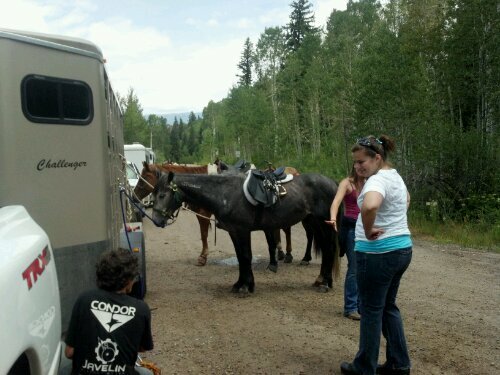 After a water/stretch break we loaded up and met some friends of mine for a trail ride up Lake Creek. 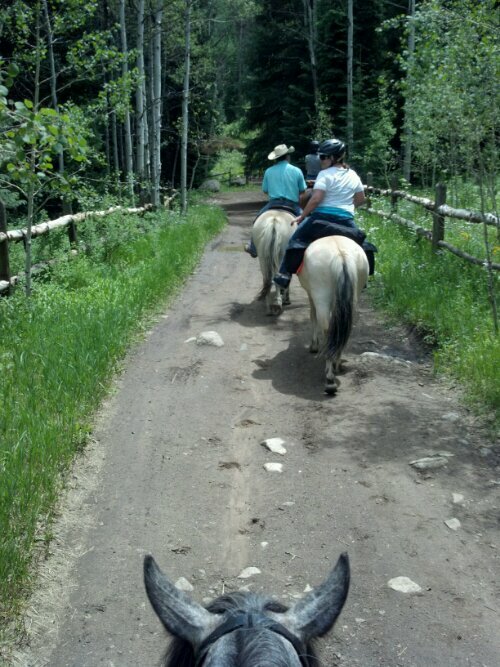 My good friend Char tagged along, as one of the ladies had 3 horses but 2 riders. It was an awesome day! The trail was pretty steep and rocky but we took it slow. It mellowed out after the first half hour. About an hour and a half up was a little pond/stream and amazing views! When we reached the pond Cello walked straight in, almost to my boots. 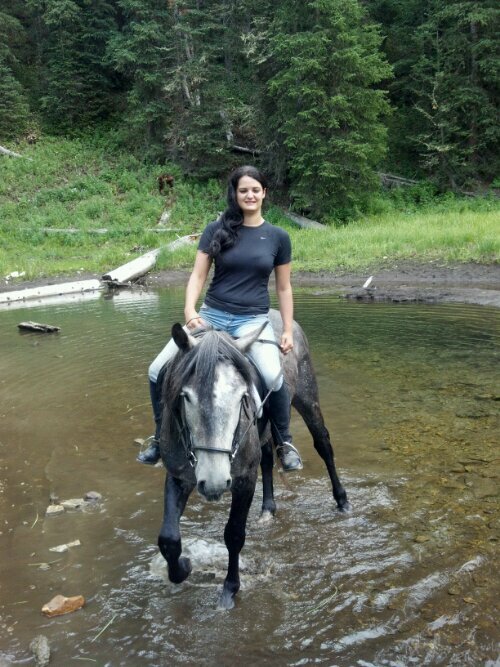 Since we were on a longer trail ride I did let him snack some with his bridle on- bad habit, sure, but I only allowed him to do it on our break when I said “okay.” He stood in the water up to his knees and ate from the bank. I was too distracted to take a lot of pictures but here’s some that had been forwarded to me. The ride down was interesting. About a half hour from the pond the wind kicked up a few times and it began to rain, pretty heavily, and there were a few cracks of thunder. We were soaked through, and the trail got slick, but we made it down all right. By the way, this horse loads in the trailed like a pro. I was really happy about that, which surprised Emilee, who then told me she trailered him all the time when she had him. I’m used to horses who are really sketched out by trailers! It was a nice change. We camped at the ranch Saturday night, and rode a little more after dinner. 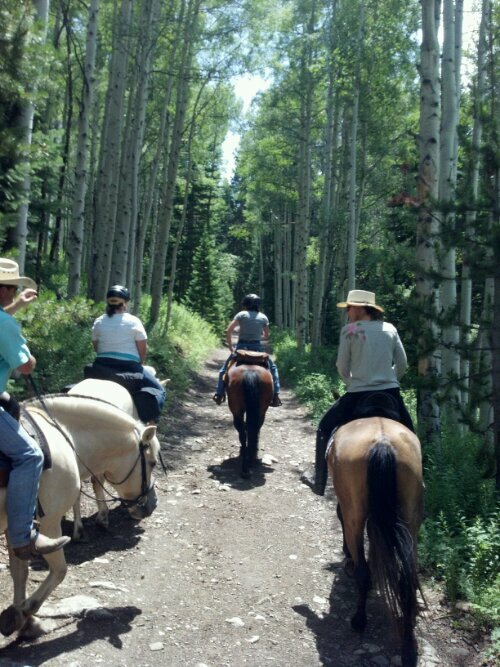 We were all pretty exhausted so we kinda spent a lot of time just sitting on the horses, but Lucas ran Cody around and we all popped over a little cross rail a few times. Cello went over easy- this week we are going to do a bit more jumping, and canter work. Monday morning we trailered to the Eagle arena. I was tired and on a time crunch to get to work, but Emilee watched me ride some then hopped on. Cello was good about that, with lawn mowers and dogs and sheep making noise. There was one little spook episode but nothing crazy. 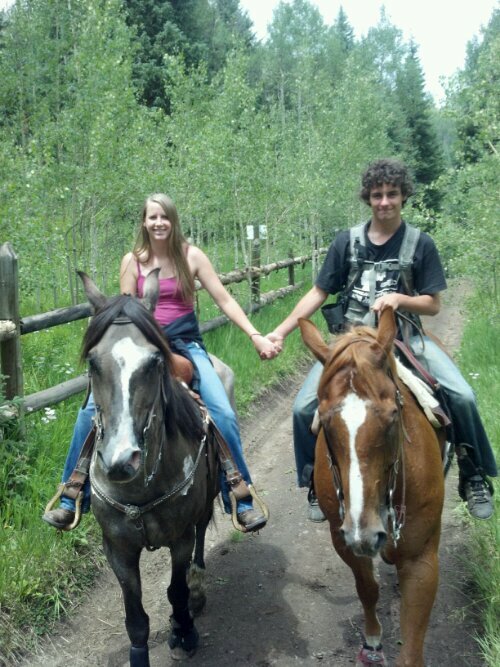 I had to leave a few minutes after watching Emilee ride him. I really wanted to watch more but was so rushed. She trimmed his feet while I was at work, then headed home. I definitely want to do this again sometime at a more relaxed place/with more free time. Emilee offered to send me training videos of her and Cello in the beginning. I really need to work on the groundwork with him, and that’s where things are still a little rough. All our current under saddle things I know how to work on (it’s a matter of getting in shape to ask correctly, like I said previously) but with groundwork with a mustang I’m a complete beginner. I told Eric I want time with Justin Dunn for my birthday 🙂 We’ll see if he remembers! 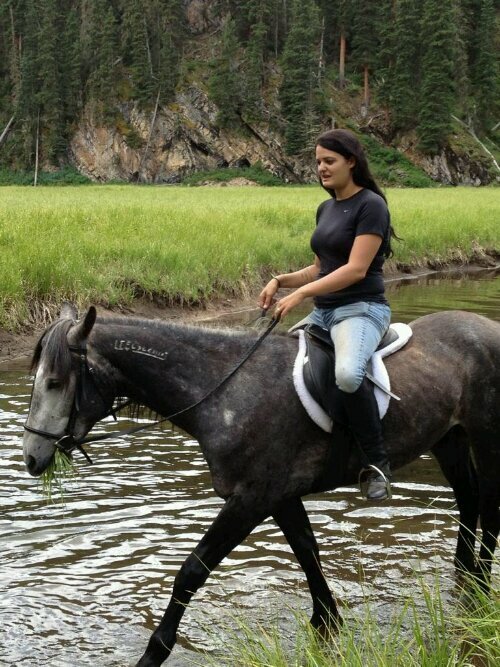 This entry was posted in Beginnings, New Things/Breakthroughs and tagged Blm mustang, Cello, Dani Neumann, Emilee Shearer, skylark therapeutic riding, wild horse project. Bookmark the permalink.